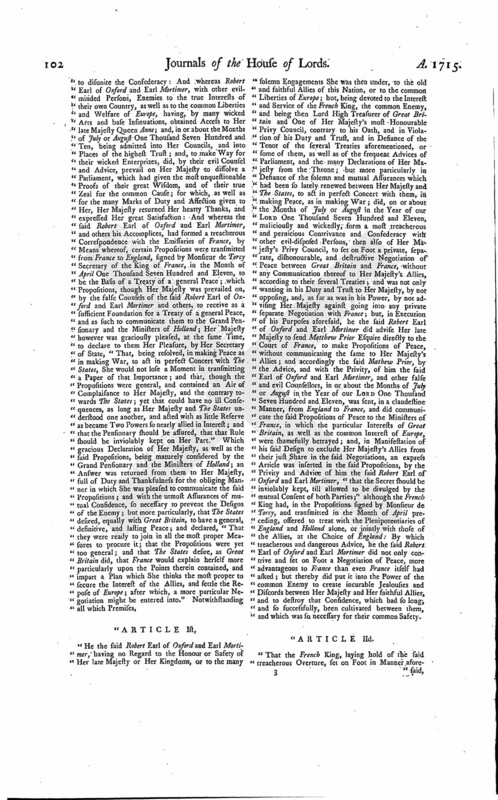 Journal of the House of Lords: Volume 20, 1714-1717. Originally published by His Majesty's Stationery Office, London, 1767-1830. Message from H. C. for the Lords to fit. Lady Mohun to revive Lord Mohun's Appeal. Lee, Leave for a Bill. Message from H. C. for the Passages to be cleared. Earl of Oxford and E. Mortimer impeached. Protest against not delaying the Consideration of their Request. Protest against not putting a Question to the Judges, Whether the Articles contain Matter of Treason? Epus. Dunelm. & Ds. Crew. Epus. Oxon. Ds. Cowper, Cancellarius. To acquaint this House, that the Commons desire their Lordships to continue sitting some Time. And the Messengers were called in; and told," That the Lords will continue sitting some Time, as desired. Hodie 2a vice lecta est Billa, intituled, " An Act for vesting certain Manors and Lands, in the Counties of Devon and Kent, the Estate of Sir William Courtenay Baronet, in Trustees and their Heirs, to be sold; and, with the Monies arising thereby, to purchase other Lands in the County of Devan, contiguous to the Seat of the Family, to be settled to the same Uses. Viscount Townsbend. Epus. Lich. & Cov. Their Lordships, or any Five of them; to meet on Saturday the Twenty-third Day of July Instant, at Ten a Clock in the Forenoon, in the Prince's Lodgings near the House of Peers; and to adjourn as they please. Hodie 3a vice lecta est Billa, intituled, "An Act for confirming the Sale of the Reversion of the Manor of Darrington, by George Earl of Cardigan, to Theophilus Shelton Esquire and his Heirs." 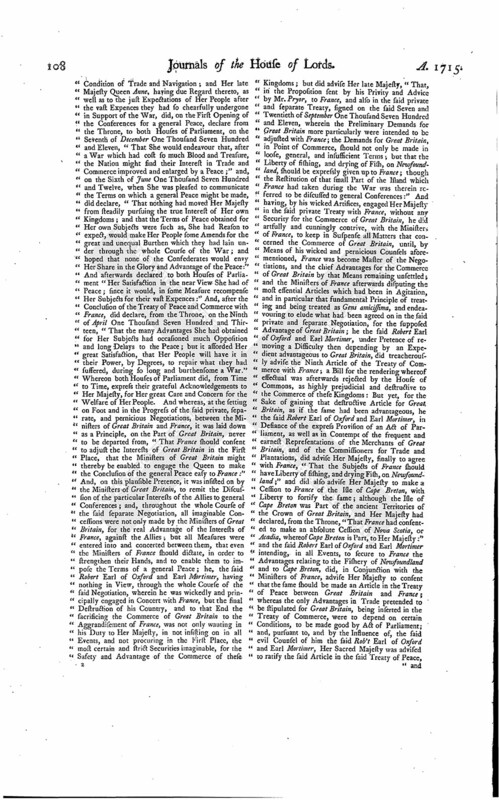 Upon reading the Petition of Elizabeth Lady Mohun, Widow, Relict, and Devisee of Charles Lord Mohun, her late Husband, deceased; setting forth, "That, on the Eleventh of February 1711, the said Lord Mohun preferred his Appeal to this House; praying, "That several Decrees of the Court of Chancery, therein complained of, made on the Behalf of Peter Minshull and others, might be reversed;" to which they were ordered to answer; but, instead of so doing, the Nineteenth of March following, petitioned for Three Months further Time to answer; which was accordingly allowed; and, at the same Time, it was ordered, "That all Proceedings on the said Decrees should be stayed in the mean Time (save the passing thereof);" but the Respondents have not yet put in any Answer; and since the Death of the said Lord Mohun, they have got into Possession of the Estate decreed to them, though the Title thereto was in Judgement before this House: And though the Petitioner hath, for recovering the same, obtained Judgement in Ejectment; yet the Respondents, to elude the Benefit thereof, have obtained an Injunction of the Court of Chancery, to hinder Execution thereon;" and praying, That the said Appeal may stand revived, and be in the same Plight and Condition it was at the Death of the said Lord Mohun; and that the Petitioner may have such further Relief in the Premises, as to this House shall seem meet:"
Their Lordships, or any Five of them; to meet on Monday next, in the Forenoon, in the Prince's Lodgings near the House of Peers; and to adjourn as they please. It is Ordered, That Leave be given to bring in a Bill, according to the Prayer of the Petition. The House being moved, "That a Day may be appointed, for hearing the Cause wherein Charles Menzies is Appellant, and Helen, Barbara, and Jean Menzies, and Robert Muir Husband to the said Barbara, are Respondents:"
It is Ordered, That this House will hear the said Cause, by Counsel, at the Bar, on Wednesday the Twentieth Day of this Instant July, at Eleven a Clock. The Duke of Bolton reported from the Committee, to whom the Bill, intituled, "An Act for confirming a Sale already made to Edmund Dummer Gentleman of some Part, and for vesting other Part, of the Estate of John Bromfield Esquire, in the County of Southampton, comprized in the Articles made upon his Marriage with Anne his Wife, in Trustees, to be sold, for the Payment of his Debts; and for settling the remaining Part thereof, as near as may be, to the Intent of the said Articles, and by making thereby, and by other Means in the Act mentioned, some Provision for the said John Bromfield and Anne his Wife and their Issue," was committed: "That they had considered the said Bill, and found the Allegations thereof to be true; that the Parties concerned had given their Consents; and that the Committee had made several Amendments to the Bill." Which were read Twice, and agreed to. To acquaint this House, that the Commons desire their Lordships will direct the Lobby and the Passage to the House of Peers to be cleared from any Crowd. Ordered, That the Lobby and Passages be cleared, according to the Desire of the House of Commons. To acquaint them, that the Lords have given Order for clearing the Lobby and Passage, as desired. 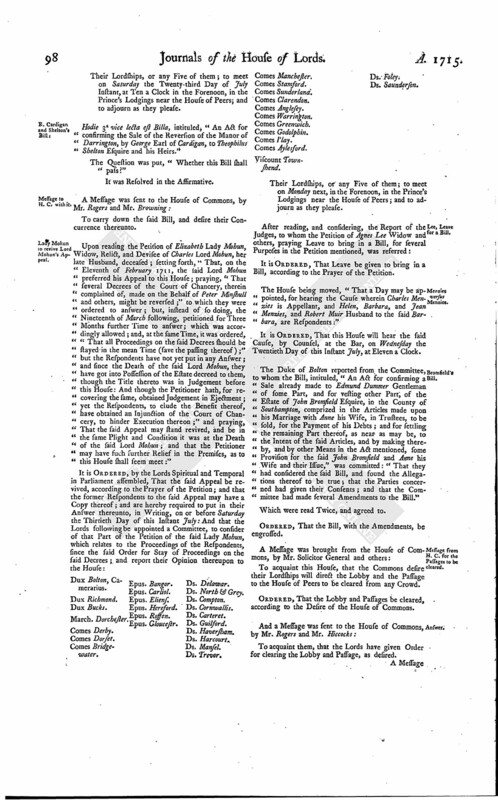 "The Commons assembled in Parliament, having received Information of divers traiterous Practices and Designs of a great Peer of this House, Robert Earl of Oxford and Earl Mortimer, have commanded me to impeach the said Earl of Oxford and Earl Mortimer of High Treason, and other high Crimes and Mildemeanors: And I do here, in their Names, and in the Name of all the Commons of Great Britain, impeach Robert Earl of Oxford and Earl Mortimer of High Treason, and other high Crimes and Misdemeanors. I am further commanded by the House of Commons, to pray and demand of your Lordships, that the Earl of Oxford and Earl Mortimer may be sequestered from Parliament, and forthwith committed to safe Custody." He further presented Articles of Impeachment of High Treason, and other high Crimes and Misdemeanors, against Robert Earl of Oxford and Earl Mortimer, in Maintenance of the said Charge. Ordered, That the Messengers from the House of Commons be called in; and told, "That the Lords will take the Request of the House of Commons into serious Consideration, and send them an Answer thereunto in convenient Time." The Usher acquainting the House, "That the Messengers were gone:"
To acquaint them, that the Lords will take their Request into serious Consideration, and send them an Answer thereunto in convenient Time. The Messengers sent to the House of Commons, being returned, acquainted the House, "That the Commons were adjourned." 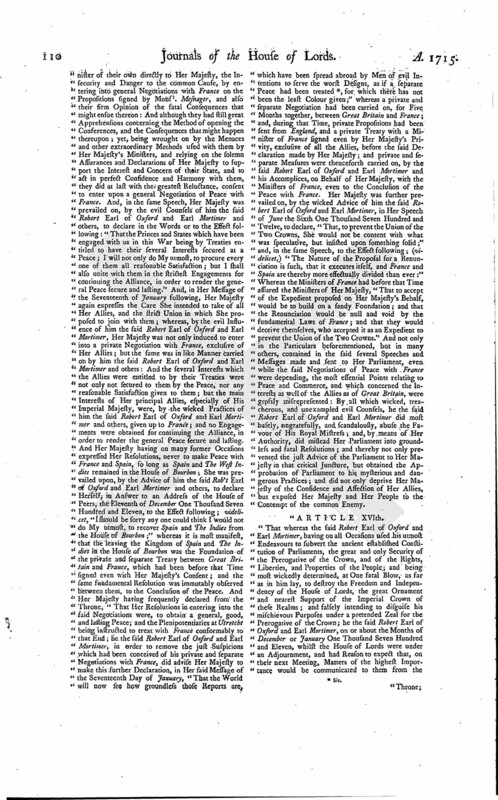 "Articles of Impeachment of High Treason, and other High Crimes and Misdemeanors, against Robert Earl of Oxford and Earl Mortimer. "He the said Robert Earl of Oxford and Earl Mortimer, having no Regard to the Honour or Safety of Her late Majesty or Her Kingdoms, or to the many solemn Engagements She was then under, to the old and faithful Allies of this Nation, or to the common Liberties of Europe; but, being devoted to the Interest and Service of the French King, the common Enemy, and being then Lord High Treasurer of Great Britain and One of Her Majesty's most Honourable Privy Council, contrary to his Oath, and in Violation of his Duty and Trust, and in Defiance of the Tenor of the several Treaties aforementioned, or some of them, as well as of the frequent Advices of Parliament, and the many Declarations of Her Majesty from the Throne; but more particularly in Defiance of the solemn and mutual Assurances which had been so lately renewed between Her Majesty and The States, to act in perfect Concert with them, in making Peace, as in making War; did, on or about the Months of July or August in the Year of our Lord One Thousand Seven Hundred and Eleven, maliciously and wickedly, form a most treacherous and pernicious Contrivance and Confederacy with other evil-disposed Persons, then also of Her Majesty's Privy Council, to set on Foot a private, separate, dishonourable, and destructive Negotiation of Peace between Great Britain and France, without any Communication thereof to Her Majesty's Allies, according to their several Treaties; and was not only wanting in his Duty and Trust to Her Majesty, by not opposing, and, as far as was in his Power, by not advising Her Majesty against going into any private separate Negotiation with France; but, in Execution of his Purposes aforesaid, he the said Robert Earl of Oxford and Earl Mortimer did advise Her late Majesty to send Matthew Prior Esquire directly to the Court of France, to make Propositions of Peace, without communicating the same to Her Majesty's Allies; and accordingly the said Mathew Prior, by the Advice, and with the Privity, of him the said Earl of Oxford and Earl Mortimer, and other false and evil Counsellors, in or about the Months of July or August in the Year of our Lord One Thousand Seven Hundred and Eleven, was sent, in a clandestine Manner, from England to France, and did communicate the said Propositions of Peace to the Ministers of France, in which the particular Interests of Great Britain, as well as the common Interest of Europe, were shamefully betrayed; and, in Manifestation of his said Design to exclude Her Majesty's Allies from their just Share in the said Negotiations, an express Article was inserted in the said Propositions, by the Privity and Advice of him the said Robert Earl of Oxford and Earl Mortimer, "that the Secret should be inviolably kept, till allowed to be divulged by the mutual Consent of both Parties;" although the French King had, in the Propositions signed by Monsieur de Torcy, and transmitted in the Month of April preceding, offered to treat with the Plenipotentiaries of England and Holland alone, or jointly with those of the Allies, at the Choice of England: By which treacherous and dangerous Advice, he the said Robert Earl of Oxford and Earl Mortimer did not only contrive and set on Foot a Negotiation of Peace, more advantageous to France than even France itself had asked; but thereby did put it into the Power of the common Enemy to create incurable Jealousies and Discords between Her Majesty and Her faithful Allies, and to destroy that Confidence, which had so long, and so successfully, been cultivated between them, and which was so necessary for their common Safety. "That the French King, laying hold of the said treacherous Overture, set on Foot in Manner aforesaid, did, in or about the Months of August or September in the Year of our Lord One Thousand Seven Hundred and Eleven, send over Monsieur Mesnager into Engl'd, to carry on a clandestine and separate Negotiation of Peace; which being made known to him the said Robert Earl of Oxford and Earl Mortimer, he did afterwards, in the said Month of September One Thousand Seven Hundred and Eleven, secretly and unlawfully, without any Colour of Authority, meet, confer, and treat, with the said Sieur Mesnager, on the Negotiations of a Peace between Great Britain and France; and therein he did advise and promote the making a private and separate Treaty or Agreement between the said Crowns; which said Treaty or Agreement was afterwards, with the Privity, Consent, and Advice, of him the said Robert Earl of Oxford and Earl Mortimer, agreed, concluded on, and signed by the said Sieur Mesnager, on the Part of France; and by the Earl of Dartmouth and Henry Saint John Esquire, Two of Her Majesty's Principal Secretaries of State, in Behalf of Her late Majesty, by Virtue only of Her Majesty's Sign Manual under the Signet, and without the least Knowledge or Participation of the Allies: In which Treaty, the immediate Interests even of Great Britain are given up to France, and the Duke of Anjou is admitted to be King of Spain; an express Stipulation being therein made with the Sieur Mesnager, in the Name, and (as is therein alledged) pursuant to Powers from, King Philip as King of Spain, whereby he the said Robert Earl of Oxford and Earl Mortimer did not only assume to himself Regal Power, in taking upon him to meet and treat with the Enemy without any Authority or Powers from Her Majesty, but did what in him lay to subvert the ancient and established Constitution of the Government of these Kingdoms, by introducing illegal and dangerous Methods of transacting the most important Affairs of the State; and by which private and separate Treaty he the said Robert Earl of Oxford and Earl Mortimer did what in him lay to dissolve and cancel the many solemn Treaties Her Majesty then stood engaged in to Her good and ancient Allies; and whereby Her Majesty, even before any Thing was finally settled for the Safety or Advantage of Her Kingdom, was brought to this fatal Dilemma, either to submit to the Dictates of France, in the Progress of the said Negotiation; or, so notorious a Breach of National Faith being divulged by the Enemy, from thence to lose all future Confidence of Her good Allies. "That the said Robert Earl of Oxfora and Earl Mortimer, the better to disguise and carry on the aforesaid private, separate, and dangerous Negotiation, did, together with other evil-disposed Persons then in high Trust under Her Majesty, contrive and advise the preparing and forming a Set of general Preliminaries, intituled, "Preliminary Articles on the Part of France, to come to a general Peace;" and that the same should be signed by the Sieur Mesnager only: And, the same being so prepared and signed by the said Sieur Mesnager, he the said Robert Earl of Oxford and Earl Mortimer did, contrary to his Duty and Trust, impiously advise Her Sacred Majesty, that the same should be, and accordingly they were, received by Her Majesty, and communicated to the Ministers of the Allies then residing in England, as the Ground of a general Negotiation of Peace, and as if the same were the only Transactions that had been on this Subject between Great Britain and France; and, to this End, the private Treaty, signed as aforesaid by the Earl of Dartmouth and Master Saint John on the Part of England, and by the said Sieur Mesnager on the Part of France, was, by the evil Advice and Contrivance of him the said Robert Earl of Oxford and Earl Mortimer, and others, wilfully and industriously concealed, not only from all the Allies, but even from Her Majesty's Council and Her Parliament: And he did further advise Her Majesty, not only to accept the said general Preliminaries; but, in Her Name, and by Her Authority, to communicate the same to The States General, as a sufficient Foundation whereon to open the Conferences of Peace with France: And, the more effectually to cover from The States General the pernicious Steps which his evil Influence had engaged Her Majesty in with the common Enemy, certain Instructions were prepared, and, by his Counsel and Advice, were signed by Her Majesty, and delivered to the Earl of Strafford, Her Ambassador to The States General; wherein the said Earl of Strafford is directed to represent to the Pensionary of Holland, and to such others as shall be appointed to confer with him, "That when Her Majesty had received, in May last, by his Excellency's Dispatches, an Account of the Sense which those among them who were at that Time in the Secret had of the Overtures made by France for setting a general Negotiation of Peace again on Foot, and of the Answer which it was desired might be returned to the Propositions signed by Monsieur de Torcy, Her Majesty did immediately acquaint the Enemy, "That their Offers were thought by Her and by The States General neither particular nor full enough; and therefore that Her Majesty did insist, that they should form a distinct Project of such a Peace as they were willing to conclude:" Whereas no such Instances had been made to the Enemy on Her Majesty's Behalf; but, on the contrary, notwithstanding Her Majesty had declared, "That the Propositions of Monsieur de Torcy were thought by Her and The States General neither particular nor full enough;" yet, without any further Explication from the Enemy, Her Majesty was prevailed on, in Manner aforesaid, to send over Propositions to France, as general and ensnaring, and in all respects as destructive to the Interests of Great Britain and Her Allies, as the Propositions of Monsieur de Torcy; and the said general Preliminaries, communicated to The States in Manner aforesaid, were calculated only to amuse and deceive them into a general Negotiation with France; and, in the Particulars abovesaid, as well as in several others the said Instructions contained Matters either false or grossly prevaricating and evasive: By which most wicked Counsels of him the said Robert Earl of Oxford and Earl Mortimer, that unquestionable Truth and Sacredness, which, by the Laws of Nations, ought to accompany and constitute the Instructions of Public Ambassadors to Princes in Friendship and Confederacy against the common Enemy, was most vilely prostituted to the most dangerous Purposes, to deceive and mislead Her Majesty's good Allies in Matters of the greatest Importance to their own Interests; and the Interests of these Kingdoms, the Honour of Her Majesty's Sacred Person, and of the Imperial Crown of these Realms, which had been raised to the highest Pitch of Glory Abroad, and had been justly held in Veneration with Her good Allies, was scandalously debased and betrayed; and the Royal Hand, by the wicked Arts of him the said Robert Earl of Oxford and Earl Mortimer, was made the Instrument to advance the Interest of the common Enemy. "That whereas the Earl of Strafford, pursuant to his said Instructions, had communicated the Preliminaries, signed by Monsieur Mesnager only, to The States General; who, being justly alarmed at the pressing Instances made on the Part of Her Majesty, that Conferences should be opened on Propositions as general and uncertain as those so lately offered by France and signed by Monsieur de Torcy, and their High Mightinesses having been unsuccessful in their Remonstrances to the Earl of Strafford against opening the Conferences upon the said Propositions, did send over Monsieur Buys, their Ambassador, to represent to Her Majesty, "as well the Hazard of meeting the Ministers of France before the essential Articles were first settled by special Preliminaries, or at least explained by France, and made specific; as likewise the Advantages to the Enemy, who, being but One Body, were influenced by One Council, and directed by One Power; whereas the Confederates consisted of several Powers, whose Interests are not only distinct, but, in many Cases, contrary to each other, whereby the French would have a fair Opportunity to divide the Allies, when it would be impossible for them to break in upon France;" and further to represent, "that the Propositions themselves were, in some Instances, very prejudicial; particularly in the Articles of Commerce, Dunkirk, and the Union of the Crowns of France and Spain:" All which Representations of the said Mr. Buys, by the evil Influence of him the said Robert Earl of Oxford and Earl Mortimer and others, were rendered ineffectual. But, in order to prevail upon The States General to open the Conferences upon the said general Preliminaries, by the Management and Contrivance of him the said Robert Earl of Oxford and Earl Mortimer and others, an Occasion was taken to declare to Mr. Buys, at a Committee of Council, in Her Majesty's Name, "Her constant Affection and good Disposition to their State, and to the promoting their Interest, and to treat with their High Mightinesses with a perfect Confidence and Harmony:" And, at the same Time, he the said Robert Earl of Oxford and Earl Mortimer did then falsely and maliciously declare, or was privy to advising and consenting that it should be and so it was declared, in Her Majesty's Name, "That She had made no separate Treaty with France; nor would ever make any, before She had fully complied with all Engagements to Her Allies; and that each of them should have Opportunity to make good their Pretensions." "By which false, scandalous, and dishonourable Assurances, he the said Robert Earl of Oxford and Earl Mortimer did not only highly dishonour Her Majesty, by whose Privity the said separate Treaty with France had been before that Time concluded and signed: But their High Mightinesses, the good Friends and ancient Allies of Her Majesty, were grossly abused, and thereby induced to enter into a Negotiation with France, so dangerous in itself, and so fatal in its Consequences. "That Her Sacred Majesty Queen Anne having, in due Form of Law, and under Her Great Seal, constituted the Right Reverend John Lord Bishop of Bristol and the Earl of Strafford Her Plenipotentiaries, with full Powers, to meet, treat, and conclude, with the Plenipotentiaries of the Confederates and those whom the French King shall on His Part depute for that Purpose, the Conditions of a good and general Peace, that shall be safe, honourable, and, as far as is possible, agreeable to the reasonable Demands of all Parties; he the said Robert Earl of Oxford and Earl Mortimer, not contenting himself to abuse the Royal Authority, to the Delusion of The States General, the nearest Allies of the Queen; but intending the universal Prejudice of His Imperial Majesty, and all the Allies of these Kingdoms, and thereby the more successfully to carry on the Measures of France, wherein he was then engaged, contrived and prepared Instructions, or was privy to, consenting, and advising the same, for Her Majesty's said Plenipotentiaries; which She was prevailed upon, by the said Robert Earl of Oxford and Earl Mortimer's evil Counsel, to sign; and the same were delivered to the said Plenipotentiaries; wherein, among other Things, they are instructed to the Effect following; videlicet, "If it shall be thought proper to begin by the Disposition of the Spanish Monarchy, you are to insist, That the Security and reasonable Satisfaction which the Allies expect, and which His Most Christian Majesty has promised, cannot be obtained, if Spain and The West Indies be allotted to any Branch of the House of Bourbon;" whereas the said Robert Earl of Oxford and Earl Mortimer had, at that Time, privately and treacherously negotiated and agreed with the Ministers of France, that Spain and The West Indies should remain in a Branch of the House of Bourbon; and had prevailed on Her Sacred Majesty to be Party to the said Private Treaty, wherein the same is necessarily implied: And the said Plenipotentiaries are further instructed, "In case the Enemy should object, as the Imperial Ministers have done, that the Second Article of the Seven, signed by the Sieur Mesnager, implies, that the Duke of Anjou shall continue on the Throne of Spain; you are to insist that those Articles, as far as they extend, are indeed binding to France; but that they lay neither us nor our Allies under any positive Obligation;" whereby the said Robert Earl of Oxford and Earl Mortimer basely entered into a Confederacy and Collusion even with the Ministers of the Enemy, and prevailed on Her Majesty to give Her Royal Consent thereto, the more effectually to impose on His Imperial Majesty and all the Allies, and to conceal the said secret Negotiations, and the separate Treaty that had been agreed on between Great Britain and France. And the said Robert Earl of Oxford and Earl Mortimer, not only in the Particulars before mentioned, but in many others contained in the said Instructions, has brought a lasting Reproach on the Crown of these Realms, and grossly violated the many Treaties wherein Her Sacred Majesty was then engaged to Her Allies, to act in perfect Concert with them throughout the Negotiations of Peace. 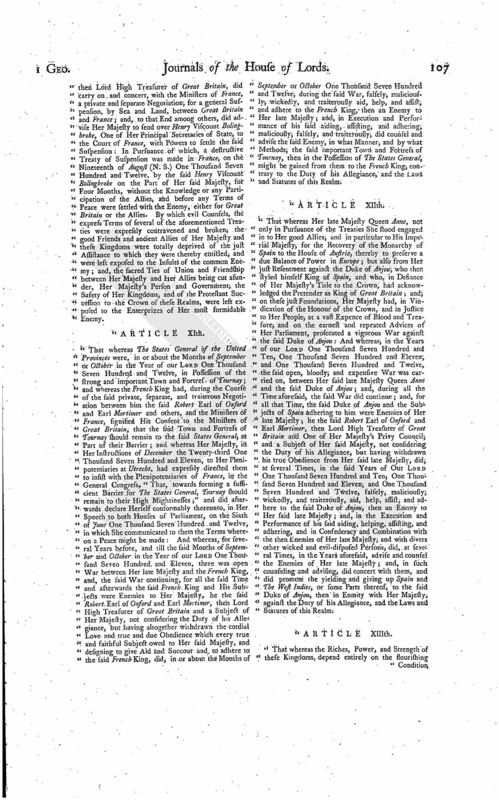 "That, the Conferences of Peace being opened between the Plenipotentiaries of the Allies and those of the Enemy, for the negotiating a general Peace, upon the mutual and most solemn Engagements amongst the Allies, not only to act in perfect Confidence with each other, but to promote their common Interest, and to obtain from the Enemy all just and reasonable Satisfaction; and a specific Explanation of the general Preliminaries having been given in by the Enemy at Utrecht, whereon the Allies delivered their respective Demands; by the Artifices of France, and the secret Encouragement and Concurrence of the Ministers of Great Britain, the Progress of the said Public Negotiation was delayed and kept in Suspense, under Pretence of the Enemies refusing to give their Answer in Writing: During which Time, he the said Robert Earl of Oxford and Earl Mortimer, again assuming to himself Regal Power, in Derogation of the Royal Authority, to treat of Peace with France, which was then delegated under the Great Seal of Great Britain to Her Majesty's Plenipotentiaries at Utrecht; and, for the promoting the Designs of the Enemy, to the apparent Destruction of the common Cause of Her Majesty and Her Allies, contrary to the known Laws and Constitution of this Kingdom, in direct Violation of the several Alliances Her Majesty then stood engaged in, and in Opposition to the many Assurances given by Her Majesty to act in Concert with Her Allies, and in Defiance of the express Instructions given to Her said Plenipotentiaries, was not only wanting in his Duty to Her Majesty, as far as in him lay, to have put an End to and prevented any further private and unlawful Negotiations with France; but did, with others his Accomplices, advise, concur, continue, and promote, a private, separate, and unjustifiable Negotiation of Peace with France, directly from England to France, without any Communication thereof to the Allies; and, in such private Negotiations, did concert, with the Ministers of the Enemy, Terms of Peace highly prejudicial to the Interest of Her Majesty and Her Kingdoms, and of all Her Allies, and whereby the good Effects of the said general Negotiations were entirely defeated. "That Her Sacred Majesty Queen Anne having been prevailed on, by the false Counsels of him the said Robert Earl of Oxford and Earl Mortimer, to accept of a Treaty with France, on the Supposition that the Spanish Monarchy should continue in the Possession of a Branch of the House of Bourbon; and it being acknowledged, even by the French King, in the general Preliminaries signed by Monsieur Mesnager, "That the Excess of Power, from the Re-union of the Crowns of France and Spain, would be contrary to the Good and general Repose of Europe;" he the said Robert Earl of Oxford and Earl Mortimer, having nothing so much in View as the aggrandizing the common Enemy, yet always intending to cover the Iniquity of his Heart under specious Pretences and false Appearances, did wickedly and treacherously advise and carry on a private and separate Negotiation with France, on the Subject of a Renunciation of his Right to the Kingdom of France by the Duke of Anjou, and that such Renunciation should be the Security against the Re-union of the Two Kingdoms; and, by the Influence of his evil Counsels, Her Majesty was prevailed on to accept, and finally to conclude and ratify, a Treaty of Peace with France, wherein the said Renunciation is taken as a sufficient Expedient to prevent the Mischiefs that threatened all Europe, in case the Crowns of France and Spain should be united upon the Head of One and the same Person; although he the said Robert Earl of Oxford and Earl Mortimer well knew that a Memorial had been, during the said separate Negotiation, transmitted, by Monsieur de Torcy Secretary of State and Minister to the French King, to One of Her Majesty's Principal Secretaries of State, whereby it was declared, "That the said Renunciation would be null and invalid, by the fundamental Laws of France; which Laws were looked upon as the Work of Him who had established all Monarchies, and which He only could abolish; and that no Renunciation therefore could destroy it; and, if the King of Spain should renounce, they would deceive themselves that should receive it as a sufficient Expedient to prevent the Mischiefs proposed to be avoided." By which false and treacherous Counsels, he the said Robert Earl of Oxford and Earl Mortimer did not only betray the Interest of the common Cause into the Hand of the most formidable Enemy; but wilfully and maliciously abused the Power and Influence which he had obtained with Her Majesty, so far as to engage Her Sacred Majesty, and the Honour of the Imperial Crown of these Kingdoms, to become Party with France in so fatal a Deceit. 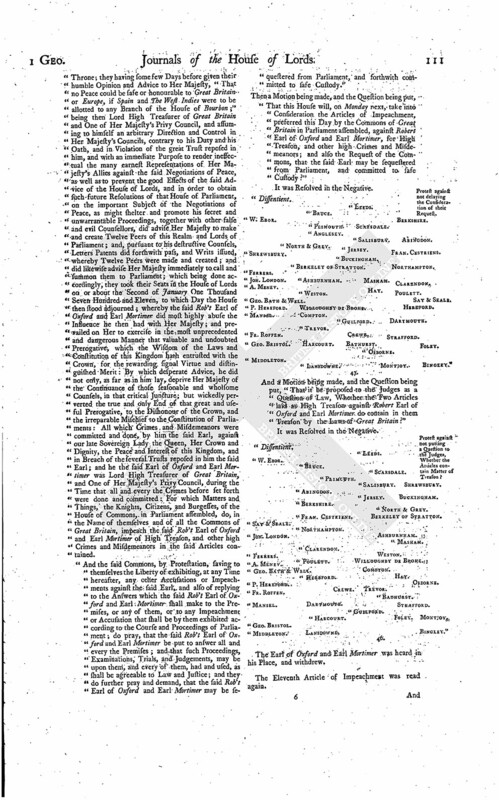 "That Her late Majesty Queen Anne having, on the Seventh Day of December in the Year of our Lord One Thousand Seven Hundred and Eleven, earnestly recommended it from the Throne, "That Provision might be made for an early Campaign, in order to carry on the War with Vigour, and as the best Way to render the Treaty of Peace effectual;" in order to which, vast Supplies were granted, and Magazines provided at a great Expence, for an early Campaign; and, in Pursuance thereof, Her Majesty having sent Her Generals Lumley and Cadogan to give early Assurances to Her Allies of Her sincere Intentions; and likewise expressly instructed Her General the Duke of Ormond, not only to renew the same Assurances, and declare Her Resolutions of pushing on the War with the utmost Vigour, but to concert, with the Generals of the Allies, the proper Measures for entering on Action; and the Confederate Army, which at that Time was the finest and strongest that had been in the Service during the whole Course of the War, and provided with all Necessaries to act with Vigour, having marched, according to the Resolution taken in Concert with Her Majesty's General, almost up to the Enemy, with a great Superiority both as to the Number and Goodness of Troops, and animated with a noble Courage and Zeal to acquit themselves bravely; so that, in all human Appearance, and with the Divine Assistance, which had appeared so visibly for them on many other Occasions, they would have been able, either by Battle or Siege, to have gained great Advantages over the Enemy, to have bettered the Affairs of the Allies, and to have facilitated the Negotiations of Peace; and the Ministers of France having frequently and earnestly represented to the said Robert Earl of Oxford and Earl Mortimer, and others his Accomplices, during their secret Negotiations, their just Apprehensions, from the Bravery and good Disposition of the Confederate Army; he the said Robert Earl of Oxford and Earl Mortimer, being truly informed of the sure Prospect, which, by the Blessing of God, the Army of the Confedrates then had, of gaining new Conquests over the Army of France, and whereby they would have been enabled to have forced Terms of Peace, safe, honourable, and lasting; in order to disappoint those comfortable Expectations of the Allies, and to give Success to his secret Negotiations with the Ministers of France, was privy to, consenting, and advising, together with other false and evil Counsellors, and, together with them, did advise and consent, that an Order should be sent, in Her Majesty's Name, to the Duke of Ormond, in Flanders, "to avoid engaging in any Siege, or hazarding a Battle, till further Orders;" although nothing had then been settled, in the said private Negotiations, for the Interest and Security of Great Britain; and although Philip King of Spain, at that Time, had not consented to the Renunciation of His Right to the Crown of France: And, not contenting himself with having obtained that fatal Step, so highly advantageous to the Cause of France, but being wickedly determined to do all that in him lay to dissolve the whole Confederacy, he the said Robert Earl of Oxford and Earl Mortimer, with others, was privy to, and did consent and advise, that Orders should be sent to the Bishop of Bristol, One of Her Majesty's Plenipotentiares then at Utrecht, to take the First solemn Opportunity to declare to the Dutch Ministers, "That Her Majesty looked on Herself, from their Conduct, to be then under no Obligation whatsoever to them:" Which Two Declarations giving just Alarm to all the Allies, they represented to the Bishop of Bristol their general Dissatisfaction, and the unexpressible Consternation they were all in: "That these Proceedings were the unavoidable Ruin of Europe:" They urged Religion, Liberty, and the Faith of Treaties, to shew the Enormity of this Usage; and The States expressed their Uneasiness on no account so much, as that they could not come to the Knowledge of their own Lot. Which Representations the Bishop of Bristol did, at the Instance of the Allies, signify to One of Her Majesty's Principal Secretaries of State. But their High Mightinesses, finding that all Applications to the Ministers of Great Britain, and in particular to the said Rob't Earl of Oxford and Earl Mortimer, were of no Avail against France, and for the Interest of the common Cause, thought it necessary, in a Manner the most moving and respectful, to address directly to Her Majesty, by a Letter of the Fifth of June One Thousand Seven Hundred and Twelve; therein expressing "their great Surprize and Affliction at the Two Declarations aforementioned; and finding it difficult to conceive how such Declarations, so prejudicial to the common Cause, given so suddenly, without their Knowledge, and undoubtedly too without the Knowledge of the other Allies, could agree and consist with the Nature of an Alliance, and with those Assurances and Engagements Her Majesty had so lately made; and not knowing how to reconcile it with the great Goodness and Kindness which Her Majesty had always honoured them with; and not being able to conceive how such a sudden Change could happen with respect to them, having carefully examined their own Conduct, and finding nothing therein that could have given Ground to Her Majesty's Dissatisfaction;" and, having represented the visible and immediate fatal Consequences of the said Two Orders, not only to the common Interest of Her Majesty and The States, but to the whole Confederacy and to the Protestant Religion, they beseeched Her Majesty, with all the Respect and all the Earnestness they were capable of, "That She would not persist in the Declarations made by the Bishop of Bristol; and would be pleased to revoke the Orders given to the Duke of Ormond, and would authorize him to act according to Occurrences, and as the Exigency of the War and the Advancement of the common Cause should require:" Notwithstanding which, he the said Robert Earl of Oxford and Earl Mortimer, being acquainted with the said Representations of The States, was not only wanting in his Duty to Her Majesty, and to his Oath, and the great Trust reposed in him, in not advising, as he ought to have done, Her Sacred Majesty to have hearkened to the said several Instances made to Her; but, persisting in his desperate and destructive Measures, for the Advancement of the Interest of the common Enemy, did afterwards advise Her Majesty to disregard and reject the same; and did countenance, encourage, advise, and promote, the said private, separate, and wicked Negotiations with France, without any Participation of the Allies, contrary to all Her Majesty's Engagements, and to the apparent Ruin of the common Cause: By which several wicked and perfidious Counsels, the Progress of the victorious Arms of the Confederates was stopped, and an Opportunity lost for conquering the Enemy, the most favourable, in the Opinion of all the General Officers and the Quarter-masters of the Allies, who were sent out to view the French Camp; and whereby all Hopes of Confidence between Her Majesty and Her Allies was entirely destroyed, and the French King made absolute Master of the Negotiations of Peace, and the Affairs of Europe given into His Hands. 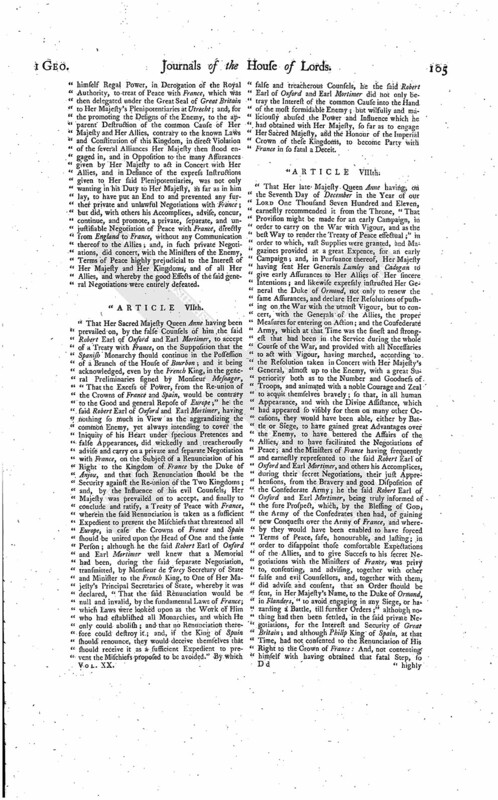 "That, to impose upon the Allies the fatal Necessity of submitting to the Terms of France, and, in order thereto, to leave the whole Confederate Army at the Mercy of the common Enemy, he the said Robert Earl of Oxford and Earl Mortimer was privy and consenting to a secret and separate Concert with the Ministers of France, without the Knowledge of the Allies, for the separating the Troops in Her Majesty's Pay from the rest of the Confederate Army; for the effecting whereof, instead of preventing as far as in him lay so fatal a Step, he was not only wanting to advise against so unwarrantable a Proceeding; but did consent to, and advise Her Majesty, that the Duke of Ormond, and all the Troops then in Her Majesty's Pay, or such of them as would obey his Orders, should separate themselves from the Army of the Confederates; and, having Notice that the Generals of the Auxiliaries paid by Her Majesty, whose Honour and Consciences would not permit them to abandon the Confederates, and leave them as a Sacrifice to France, but, for the Sake of the common Interest of Europe, and according to the true End and Design of their Conventions, did refuse to withdraw with the Duke of Ormond without particular Orders from their respective Masters; he the said Rob't Earl of Oxford and Earl Mortimer, being then Lord High Treasurer of Great Britain, and One of Her Majesty's most Honourable Privy Council, in Violation of his Oath, and the Duty and Trust reposed in him, did take upon himself an arbitrary and illegal Power, to refuse and put a Stop to the Pay and Subsidies due on account of the said Foreign Troops, although they were entitled thereto by the Conventions entered into with Her Sacred Majesty, and by express Provision made by Act of Parliament for the Payment of the same: By which fatal Separation, which, pursuant to his evil Counsels, was afterwards made, great Numbers of the Confederate Troops, who had before, on many Occasions, signalized themselves in the Defence of the Cause of Europe, soon afterwards, at the unfortunate Action of Denain, fell as Sacrifices to the Fury and Revenge of France; the Siege of Landrecy was raised; the important Towns and Fortresses of Quesnoy, Bouchain, and Doway were retaken by the French Army; and not only the Fortune of the War, but the Fate of Europe, decided in Favour of France. "That, in further Execution of his pernicious Designs, to complete the Destruction of the common Cause of Europe, and to render it impracticable for Her Majesty to resume the War against France in Conjunction with Her Allies, or to recover the Union with Her Majesty's old and faithful Allies, so necessary to the Preservation of these Kingdoms, he the said Robert Earl of Oxford and Earl Mortimer, then Lord High Treasurer of Great Britain, did carry on and concert, with the Ministers of France, a private and separate Negotiation, for a general Suspension, by Sea and Land, between Great Britain and France; and, to that End among others, did advise Her Majesty to send over Henry Viscount Bolingbroke, One of Her Principal Secretaries of State, to the Court of France, with Powers to settle the said Suspension: In Pursuance of which, a destructive Treaty of Suspension was made in France, on the Nineteenth of August (N. S.) One Thousand Seven Hundred and Twelve, by the said Henry Viscount Bolingbroke on the Part of Her said Majesty, for Four Months, without the Knowledge or any Participation of the Allies, and before any Terms of Peace were settled with the Enemy, either for Great Britain or the Allies. By which evil Counsels, the express Terms of several of the aforementioned Treaties were expressly contravened and broken, the good Friends and ancient Allies of Her Majesty and these Kingdoms were totally deprived of the just Assistance to which they were thereby entitled, and were left exposed to the Insults of the common Enemy; and, the sacred Ties of Union and Friendship between Her Majesty and Her Allies being cut asunder, Her Majesty's Person and Government, the Safety of Her Kingdoms, and of the Protestant Succession to the Crown of these Realms, were left exposed to the Enterprizes of Her most formidable Enemy. 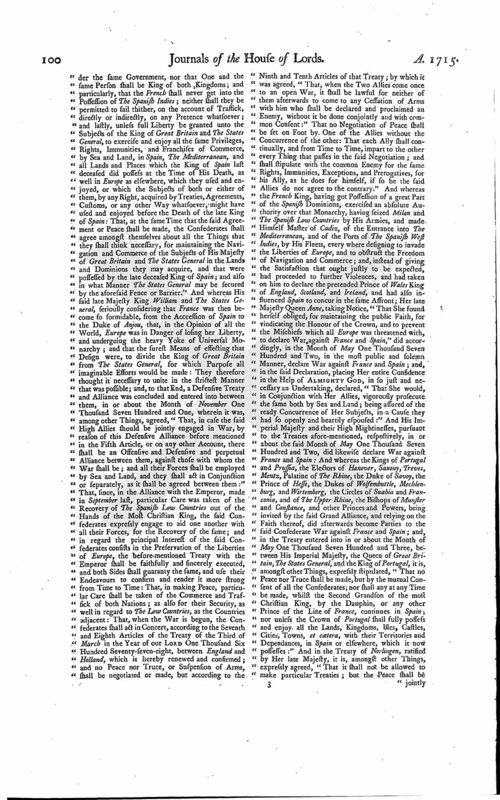 "That whereas The States General of the United Provinces were, in or about the Months of September or October in the Year of our Lord One Thousand Seven Hundred and Twelve, in Possession of the strong and important Town and Fortress of Tournay; and whereas the French King had, during the Course of the said private, separate, and traiterous Negotiation between him the said Robert Earl of Oxford and Earl Mortimer and others, and the Ministers of France, signified His Consent to the Ministers of Great Britain, that the said Town and Fortress of Tournay should remain to the said States General, as Part of their Barrier; and whereas Her Majesty, in Her Instructions of December the Twenty-third One Thousand Seven Hundred and Eleven, to Her Plenipotentiaries at Utrecht, had expressly directed them to insist with the Plenipotentiaries of France, in the General Congress, "That, towards forming a sufficient Barrier for The States General, Tournay should remain to their High Mightinesses;" and did afterwards declare Herself conformably thereunto, in Her Speech to both Houses of Parliament, on the Sixth of June One Thousand Seven Hundred and Twelve, in which She communicated to them the Terms whereon a Peace might be made: And whereas, for several Years before, and till the said Months of September and October in the Year of our Lord One Thousand Seven Hundred and Eleven, there was open War between Her late Majesty and the French King, and, the said War continuing, for all the said Time and afterwards the said French King and His Subjects were Enemies to Her Majesty, he the said Robert Earl of Oxford and Earl Mortimer, then Lord High Treasurer of Great Britain and a Subject of Her Majesty, not considering the Duty of his Allegiance, but having altogether withdrawn the cordial Love and true and due Obedience which every true and faithful Subject owed to Her said Majesty, and designing to give Aid and Succour and to adhere to the said French King, did, in or about the Months of September or October One Thousand Seven Hundred and Twelve, during the said War, falsely, maliciously, wickedly, and traiterously aid, help, and assist, and adhere to the French King, then an Enemy to Her late Majesty; and, in Execution and Performance of his said aiding, assisting, and adhering, maliciously, falsely, and traiterously, did counsel and advise the said Enemy, in what Manner, and by what Methods, the said important Town and Fortress of Tournay, then in the Possession of The States General, might be gained from them to the French King, contrary to the Duty of his Allegiance, and the Laws and Statutes of this Realm. "That whereas Her late Majesty Queen Anne, not only in Pursuance of the Treaties She stood engaged in to Her good Allies, and in particular to His Imperial Majesty, for the Recovery of the Monarchy of Spain to the House of Austria, thereby to preserve a due Balance of Power in Europe; but also from Her just Resentment against the Duke of Anjou, who then styled himself King of Spain, and who, in Defiance of Her Majesty's Title to the Crown, had acknowledged the Pretender as King of Great Britain; and, on these just Foundations, Her Majesty had, in Vindication of the Honour of the Crown, and in Justice to Her People, at a vast Expence of Blood and Treasure, and on the earnest and repeated Advices of Her Parliament, prosecuted a vigorous War against the said Duke of Anjou: And whereas, in the Years of our Lord One Thousand Seven Hundred and Ten, One Thousand Seven Hundred and Eleven, and One Thousand Seven Hundred and Twelve, the said open, bloody, and expensive War was carried on, between Her said late Majesty Queen Anna and the said Duke of Anjou; and, during all the Time aforesaid, the said War did continue; and, for all that Time, the said Duke of Anjou and the Subjects of Spain adhering to him were Enemies of Her late Majesty; he the said Robert Earl of Oxford and Earl Mortimer, then Lord High Treasurer of Great Britain and One of Her Majesty's Privy Council, and a Subject of Her said Majesty, not considering the Duty of his Allegiance, but having withdrawn his true Obedience from Her said late Majesty, did, at several Times, in the said Years of Our Lord One Thousand Seven Hundred and Ten, One Thousand Seven Hundred and Eleven, and One Thousand Seven Hundred and Twelve, falsely, maliciously; wickedly, and traiterously, aid, help, assist, and adhere to the said Duke of Anjou, then an Enemy to Her said late Majesty; and, in the Execution and Performance of his said aiding, helping, assisting, and adhering, and in Confederacy and Combination with the then Enemies of Her late Majesty, and with divers other wicked and evil-disposed Persons, did, at several Times, in the Years aforesaid, advise and counsel the Enemies of Her late Majesty; and, in such counseling and advising, did concert with them, and did promote the yielding and giving up Spain and The West Indies, or some Parts thereof, to the said Duke of Anjou, then in Enmity with Her Majesty, against the Duty of his Allegiance, and the Laws and Statutes of this Realm. "That whereas the Riches, Power, and Strength of these Kingdoms, depend entirely on the flourishing Condition of Trade and Navigation; and Her late Majesty Queen Anne, having due Regard thereto, as well as to the just Expectations of Her People after the vast Expences they had so chearfully undergone in Support of the War, did, on the First Opening of the Conferences for a general Peace, declare from the Throne, to both Houses of Parliament, on the Seventh of December One Thousand Seven Hundred and Eleven, "That She would endeavour that, after a War which had cost so much Blood and Treasure, the Nation might find their Interest in Trade and Commerce improved and enlarged by a Peace;" and, on the Sixth of June One Thousand Seven Hundred and Twelve, when She was pleased to communicate the Terms on which a general Peace might be made, did declare, "That nothing had moved Her Majesty from steadily pursuing the true Interest of Her own Kingdoms; and that the Terms of Peace obtained for Her own Subjects were such as, She had Reason to expect, would make Her People some Amends for the great and unequal Burthen which they had lain under through the whole Course of the War; and hoped that none of the Confederates would envy Her Share in the Glory and Advantage of the Peace:" And afterwards declared to both Houses of Parliament "Her Satisfaction in the near View She had of Peace; since it would, in some Measure recompense Her Subjects for their vast Expences:" And, after the Conclusion of the Treaty of Peace and Commerce with France, did declare, from the Throne, on the Ninth of April One Thousand Seven Hundred and Thirteen, "That the many Advantages She had obtained for Her Subjects had occasioned much Opposition and long Delays to the Peace; but it afforded Her great Satisfaction, that Her People will have it in their Power, by Degrees, to repair what they had suffered, during so long and burthensome a War." Whereon both Houses of Parliament did, from Time to Time, express their grateful Acknowledgements to Her Majesty, for Her great Care and Concern for the Welfare of Her People. 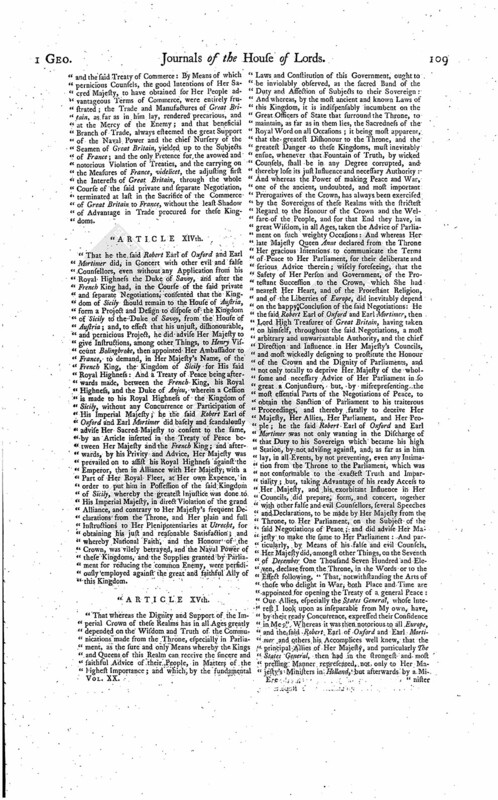 And whereas, at the setting on Foot and in the Progress of the said private, separate, and pernicious Negotiations, between the Ministers of Great Britain and France, it was laid down as a Principle, on the Part of Great Britain, never to be departed from, "That France should consent to adjust the Interests of Great Britain in the First Place, that the Ministers of Great Britain might thereby be enabled to engage the Queen to make the Conclusion of the general Peace easy to France:" And, on this plausible Pretence, it was insisted on by the Ministers of Great Britain, to remit the Discussion of the particular Interests of the Allies to general Conferences; and, throughout the whole Course of the said separate Negotiation, all imaginable Concessions were not only made by the Ministers of Great Britain, for the real Advantage of the Interests of France, against the Allies; but all Measures were entered into and concerted between them, that even the Ministers of France should dictate, in order to strengthen their Hands, and to enable them to impose the Terms of a general Peace; he, the said Robert Earl of Oxford and Earl Mortimer, having nothing in View, through the whole Course of the said Negotiation, wherein he was wickedly and principally engaged in Concert with France, but the final Destruction of his Country, and to that End the sacrificing the Commerce of Great Britain to the Aggrandisement of France, was not only wanting in his Duty to Her Majesty, in not insisting on in all Events, and not procuring in the First Place, the most certain and strict Securities imaginable, for the Safety and Advantage of the Commerce of these Kingdoms; but did advise Her late Majesty, "That, in the Proposition sent by his Privity and Advice by Mr. Pryor, to France, and also in the said private and separate Treaty, signed on the said Seven and Twentieth of September One Thousand Seven Hundred and Eleven, wherein the Preliminary Demands for Great Britain more particularly were intended to be adjusted with France; the Demands for Great Britain, in Point of Commerce, should not only be made in loose, general, and insufficient Terms; but that the Liberty of fishing, and drying of Fish, on Newfoundland, should be expressly given up to France; though the Restitution of that small Part of the Island which France had taken during the War was therein referred to be discussed to general Conferences:" And having, by his wicked Artifices, engaged Her Majesty in the said private Treaty with France, without any Security for the Commerce of Great Britain, he did artfully and cunningly contrive, with the Ministers of France, to keep in Suspense all Matters that concerned the Commerce of Great Britain, until, by Means of his wicked and pernicious Counsels aforementioned, France was become Master of the Negotiations, and the chief Advantages for the Commerce of Great Britain by that Means remaining unsettled; and the Ministers of France afterwards disputing the most essential Articles which had been in Agitation, and in particular that fundamental Principle of treating and being treated as Gens amicissima, and endeavouring to clude what had been agreed on in the said private and separate Negotiation, for the supposed Advantage of Great Britain; he the said Robert Earl of Oxford and Earl Mortimer, under Pretence of removing a Difficulty then depending by an Expedient advantageous to Great Britain, did treacherously advise the Ninth Article of the Treaty of Commerce with France; a Bill for the rendering whereof effectual was afterwards rejected by the House of Commons, as highly prejudicial and destructive to the Commerce of these Kingdoms: But yet, for the Sake of gaining that destructive Article for Great Britain, as if the same had been advantageous, he the said Robert Earl of Oxford and Earl Mortimer, in Defiance of the express Provision of an Act of Parliament, as well as in Contempt of the frequent and earnest Representations of the Merchants of Great Britain, and of the Commissioners for Trade and Plantations, did advise Her Majesty, finally to agree with France, "That the Subjects of France should have Liberty of fishing, and drying Fish, on Newfoundland;" and did also advise Her Majesty to make a Cession to France of the Isle of Cape Breton, with Liberty to fortify the same; although the Isle of Cape Breton was Part of the ancient Territories of the Crown of Great Britain, and Her Majesty had declared, from the Throne, "That France had consented to make an absolute Cession of Nova Scotia, or Acadia, whereof Cape Breton is Part, to Her Majesty:" and the said Robert Earl of Oxford and Earl Mortimer intending, in all Events, to secure to France the Advantages relating to the Fishery of Newfoundland and to Cape Breton, did, in Conjunction with the Ministers of France, advise Her Majesty to consent that the same should be made an Article in the Treaty of Peace between Great Britain and France; whereas the only Advantages in Trade pretended to be stipulated for Great Britain, being inserted in the Treaty of Commerce, were to depend on certain Conditions, to be made good by Act of Parliament; and, pursuant to, and by the Influence of, the said evil Counsel of him the said Rob't Earl of Oxford and Earl Mortimer, Her Sacred Majesty was advised to ratify the said Article in the said Treaty of Peace, and the said Treaty of Commerce: By Means of which pernicious Counsels, the good Intentions of Her Sacred Majesty, to have obtained for Her People advantageous Terms of Commerce, were entirely frustrated; the Trade and Manufactures of Great Britain, as far as in him lay, rendered precarious, and at the Mercy of the Enemy; and that beneficial Branch of Trade, always esteemed the great Support of the Naval Power and the chief Nursery of the Seamen of Great Britain, yielded up to the Subjects of France; and the only Pretence for the avowed and notorious Violation of Treaties, and the carrying on the Measures of France, videlicet, the adjusting first the Interests of Great Britain, through the whole Course of the said private and separate Negotiation, terminated at last in the Sacrifice of the Commerce of Great Britain to France, without the least Shadow of Advantage in Trade procured for these Kingdoms. "That he the said Robert Earl of Oxford and Earl Mortimer did, in Concert with other evil and false Counsellors, even without any Application from his Royal Highness the Duke of Savoy, and after the French King had, in the Course of the said private and separate Negotiations, consented that the Kingdom of Sicily should remain to the House of Austria, form a Project and Design to dispose of the Kingdom of Sicily to the Duke of Savoy, from the House of Austria; and, to effect that his unjust, dishonourable, and pernicious Project, he did advise Her Majesty to give Instructions, among other Things, to Henry Viscount Bolingbroke, then appointed Her Ambassador to France, to demand, in Her Majesty's Name, of the French King, the Kingdom of Sicily for His said Royal Highness: And a Treaty of Peace being afterwards made, between the French King, his Royal Highness, and the Duke of Anjou, wherein a Cession is made to his Royal Highness of the Kingdom of Sicily, without any Concurrence or Participation of His Imperial Majesty; he the said Robert Earl of Oxford and Earl Mortimer did basely and scandalously advise Her Sacred Majesty to consent to the same, by an Article inserted in the Treaty of Peace between Her Majesty and the French King; and afterwards, by his Privity and Advice, Her Majesty was prevailed on to assist his Royal Highness against the Emperor, then in Alliance with Her Majesty, with a Part of Her Royal Fleet, at Her own Expence, in order to put him in Possession of the said Kingdom of Sicily, whereby the greatest Injustice was done to His Imperial Majesty, in direct Violation of the grand Alliance, and contrary to Her Majesty's frequent Declarations from the Throne, and Her plain and full Instructions to Her Plenipotentiaries at Utrecht, for obtaining his just and reasonable Satisfaction; and whereby National Faith, and the Honour of the Crown, was vilely betrayed, and the Naval Power of these Kingdoms, and the Supplies granted by Parliament for reducing the common Enemy, were persidiously employed against the great and faithful Ally of this Kingdom. "That whereas the Dignity and Support of the Imperial Crown of these Realms has in all Ages greatly depended on the Wisdom and Truth of the Communications made from the Throne, especially in Parliament, as the sure and only Means whereby the Kings and Queens of this Realm can receive the sincere and faithful Advice of their People, in Matters of the highest Importance; and which, by the fundamental Laws and Constitution of this Government, ought to be inviolably observed, as the sacred Band of the Duty and Affection of Subjects to their Sovereign: And whereas, by the most ancient and known Laws of this Kingdom, it is indispensably incumbent on the Great Officers of State that surround the Throne, to maintain, as far as in them lies, the Sacredness of the Royal Word on all Occasions; it being most apparent, that the greatest Dishonour to the Throne, and the greatest Danger to these Kingdoms, must inevitably ensue, whenever that Fountain of Truth, by wicked Counsels, shall be in any Degree corrupted, and thereby lose its just Influence and necessary Authority: And whereas the Power of making Peace and War, one of the ancient, undoubted, and most important Prerogatives of the Crown, has always been exercised by the Sovereigns of these Realms with the strictest Regard to the Honour of the Crown and the Welfare of the People, and for that End they have, in great Wisdom, in all Ages, taken the Advice of Parliament on such weighty Occasions: And whereas Her late Majesty Queen Anne declared from the Throne Her gracious Intentions to communicate the Terms of Peace to Her Parliament, for their deliberate and serious Advice therein; wisely foreseeing, that the Safety of Her Person and Government, of the Protestant Succession to the Crown, which She had nearest Her Heart, and of the Protestant Religion, and of the Liberties of Europe, did inevitably depend on the happy Conclusion of the said Negotiations: He the said Robert Earl of Oxford and Earl Mortimer, then Lord High Treasurer of Great Britain, having taken on himself, throughout the said Negotiations, a most arbitrary and unwarrantable Authority, and the chief Direction and Influence in Her Majesty's Councils, and most wickedly designing to prostitute the Honour of the Crown and the Dignity of Parliaments, and not only totally to deprive Her Majesty of the wholsome and necessary Advice of Her Parliament in so great a Conjuncture, but, by misrepresenting the most essential Parts of the Negotiations of Peace, to obtain the Sanction of Parliament to his traiterous Proceedings, and thereby fatally to deceive Her Majesty, Her Allies, Her Parliament, and Her People; he the said Robert Earl of Oxford and Earl Mortimer was not only wanting in the Discharge of that Duty to his Sovereign which became his high Station, by not advising against, and, as far as in him lay, in all Events, by not preventing, even any Intimation from the Throne to the Parliament, which was not conformable to the exactest Truth and Impartiality; but, taking Advantage of his ready Access to Her Majesty, and his exorbitant Influence in Her Councils, did prepare, form, and concert, together with other false and evil Counsellors, several Speeches and Declarations, to be made by Her Majesty from the Throne, to Her Parliament, on the Subject of the said Negotiations of Peace; and did advise Her Majesty to make the same to Her Parliament: And particularly, by Means of his false and evil Counsels, Her Majesty did, amongst other Things, on the Seventh of December One Thousand Seven Hundred and Eleven, declare from the Throne, in the Words or to the Effect following, "That, notwithstanding the Arts of those who delight in War, both Place and Time are appointed for opening the Treaty of a general Peace: Our Allies, especially the States General, whose Interest I look upon as inseparable from My own, have, by their ready Concurrence, expressed their Confidence in Me:" Whereas it was then notorious to all Europe, and the said Robert Earl of Oxford and Earl Mortimer and others his Accomplices well knew, that the principal Allies of Her Majesty, and particularly The States General, then had in the strongest and most pressing Manner represented, not only to Her Majesty's Ministers in Holland, but afterwards by a Minister of their own directly to Her Majesty, the Insecurity and Danger to the common Cause, by entering into general Negotiations with France on the Propositions signed by Monsr. 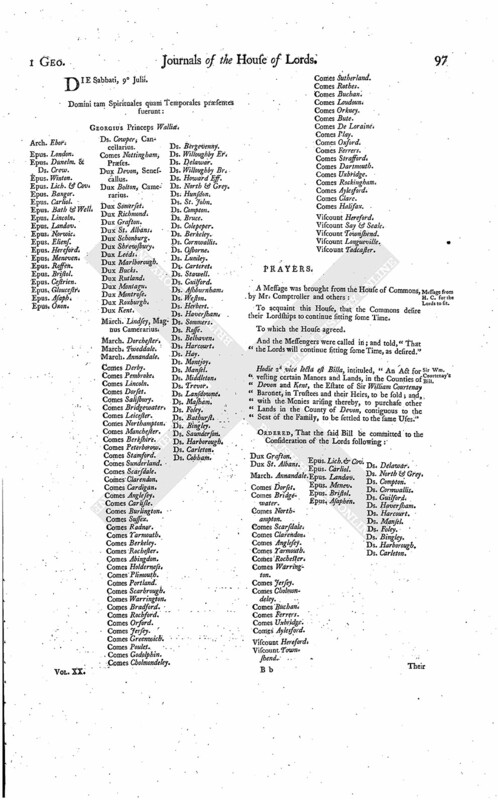 Mesnager, and also their firm Opinion of the fatal Consequences that might ensue thereon: And although they had still great Apprehensions concerning the Method of opening the Conferences, and the Consequences that might happen thereupon; yet, being wrought on by the Menaces and other extraordinary Methods used with them by Her Majesty's Ministers, and relying on the solemn Assurances and Declarations of Her Majesty to support the Interest and Concern of their State, and to act in perfect Confidence and Harmony with them, they did at last with the greatest Reluctance consent to enter upon a general Negotiation of Peace with France. And, in the same Speech, Her Majesty was prevailed on, by the evil Counsels of him the said Robert Earl of Oxford and Earl Mortimer and others, to declare in the Words or to the Effect following: "That the Princes and States which have been engaged with us in this War being by Treaties entitled to have their several Interests secured at a Peace; I will not only do My utmost, to procure every one of them all reasonable Satisfaction; but I shall also unite with them in the strictest Engagements for continuing the Alliance, in order to render the general Peace secure and lasting." And, in Her Message of the Seventeenth of January following, Her Majesty again expresses the Care She intended to take of all Her Allies, and the strict Union in which She proposed to join with them; whereas, by the evil Influence of him the said Robert Earl of Oxford and Earl Mortimer, Her Majesty was not only induced to enter into a private Negotiation with France, exclusive of Her Allies; but the same was in like Manner carried on by him the said Robert Earl of Oxford and Earl Mortimer and others: And the several Interests which the Allies were entitled to by their Treaties were not only not secured to them by the Peace, nor any reasonable Satisfaction given to them; but the main Interests of Her principal Allies, especially of His Imperial Majesty, were, by the wicked Practices of him the said Robert Earl of Oxford and Earl Mortimer and others, given up to France; and no Engagements were obtained for continuing the Alliance, in order to render the general Peace secure and lasting. And Her Majesty having on many former Occasions expressed Her Resolutions, never to make Peace with France and Spain, so long as Spain and The West Indies remained in the House of Bourbon; She was prevailed upon, by the Advice of him the said Rob't Earl of Oxford and Earl Mortimer and others, to declare Herself, in Answer to an Address of the House of Peers, the Eleventh of December One Thousand Seven Hundred and Eleven, to the Effect following; videlicet, "I should be sorry any one could think I would not do My utmost, to recover Spain and The Indies from the House of Bourbon;" whereas it is most manifest, that the leaving the Kingdom of Spain and The Indies in the House of Bourbon was the Foundation of the private and separate Treaty between Great Britain and France, which had been before that Time signed even with Her Majesty's Consent; and the same fundamental Resolution was immutably observed between them, to the Conclusion of the Peace. And Her Majesty having frequently declared from the Throne, "That Her Resolutions in entering into the said Negociations were, to obtain a general, good, and lasting Peace; and the Plenipotentiaries at Utretcht being instructed to treat with France conformably to that End; he the said Robert Earl of Oxford and Earl Mortimer, in order to remove the just Suspicions which had been conceived of his private and separate Negotiations with France, did advise Her Majesty to make this further Declaration, in Her said Message of the Seventeenth Day of January, "That the World will now see how groundless those Reports are, which have been spread abroad by Men of evil Intentions to serve the worst Designs, as if a separate Peace had been treated (fn. 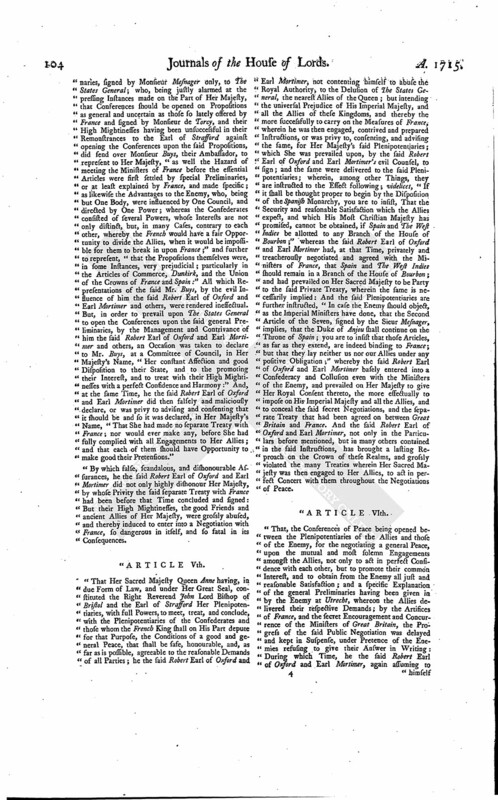 1), for which there has not been the least Colour given;" whereas a private and separate Negotiation had been carried on, for Five Months together, between Great Britain and France; and, during that Time, private Propositions had been sent from England, and a private Treaty with a Minister of France signed even by Her Majesty's Privity, exclusive of all the Allies, before the said Declaration made by Her Majesty; and private and separate Measures were thenceforth carried on, by the said Robert Earl of Oxford and Earl Mortimer and his Accomplices, on Behalf of Her Majesty, with the Ministers of France, even to the Conclusion of the Peace with France. Her Majesty was further prevailed on, by the wicked Advice of him the said Robert Earl of Oxford and Earl Mortimer, in Her Speech of June the Sixth One Thousand Seven Hundred and Twelve, to declare, "That, to prevent the Union of the Two Crowns, She would not be content with what was speculative, but insisted upon something solid;" and, in the same Speech, to the Effect following; (videlicet,) "The Nature of the Proposal for a Renunciation is such, that it executes itself, and France and Spain are thereby more effectually divided than ever:" Whereas the Ministers of France had before that Time assured the Ministers of Her Majesty, "That to accept of the Expedient proposed on Her Majesty's Behalf, would be to build on a sandy Foundation; and that the Renunciation would be null and void by the fundamental Laws of France; and that they would deceive themselves, who accepted it as an Expedient to prevent the Union of the Two Crowns." 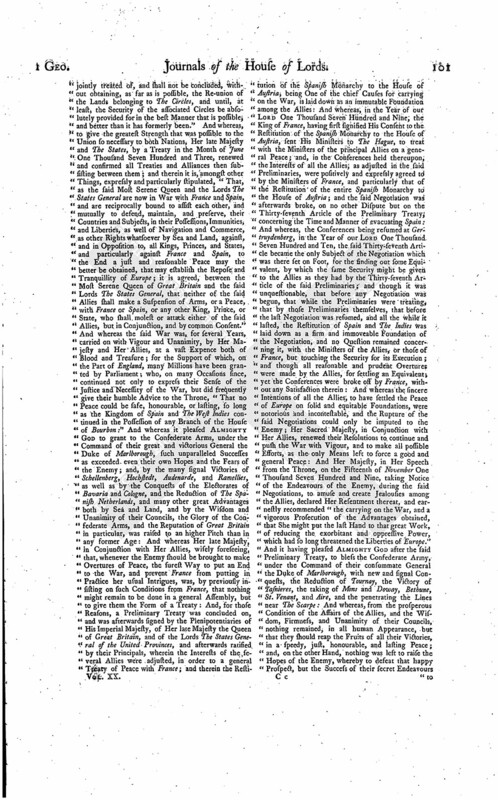 And not only in the Particulars beforementioned, but in many others, contained in the said several Speeches and Messages made and sent to Her Parliament, even while the said Negotiations of Peace with France were depending, the most essential Points relating to Peace and Commerce, and which concerned the Interests as well of the Allies as of Great Britain, were grossly misrepresented: By all which wicked, treacherous, and unexampled evil Counsels, he the said Robert Earl of Oxford and Earl Mortimer did most basely, ungratefully, and scandalously, abuse the Favour of His Royal Mistress; and, by means of Her Authority, did mislead Her Parliament into groundless and fatal Resolutions; and thereby not only prevented the just Advice of the Parliament to Her Majesty in that critical Juncture, but obtained the Approbation of Parliament to his mysterious and dangerous Practices; and did not only deprive Her Majesty of the Confidence and Affection of Her Allies, but exposed Her Majesty and Her People to the Contempt of the common Enemy. "That whereas the said Robert Earl of Oxford and Earl Mortimer, having on all Occasions used his utmost Endeavours to subvert the ancient established Constitution of Parliaments, the great and only Security of the Prerogative of the Crown, and of the Rights, Liberties, and Properties of the People; and being most wickedly determined, at One fatal Blow, as far as in him lay, to destroy the Freedom and Independency of the House of Lords, the great Ornament and nearest Support of the Imperial Crown of these Realms; and falsely intending to disguise his mischievous Purposes under a pretended Zeal for the Prerogative of the Crown; he the said Robert Earl of Oxford and Earl Mortimer, on or about the Months of December or January One Thousand Seven Hundred and Eleven, whilst the House of Lords were under an Adjournment, and had Reason to expect that, on their next Meeting, Matters of the highest Importance would be communicated to them from the Throne; they having some few Days before given their humble Opinion and Advice to Her Majesty, "That no Peace could be safe or honourable to Great Britain or Europe, if Spain and The West Indies were to be allotted to any Branch of the House of Bourbon;" being then Lord High Treasurer of Great Britain and One of Her Majesty's Privy Council, and assuming to himself an arbitrary Direction and Control in Her Majesty's Councils, contrary to his Duty and his Oath, and in Violation of the great Trust reposed in him, and with an immediate Purpose to render ineffectual the many earnest Representations of Her Majesty's Allies against the said Negotiations of Peace, as well as to prevent the good Effects of the said Advice of the House of Lords, and in order to obtain such future Resolutions of that House of Parliament, on the important Subject of the Negotiations of Peace, as might shelter and promote his secret and unwarrantable Proceedings, together with other false and evil Counsellors, did advise Her Majesty to make and create Twelve Peers of this Realm and Lords of Parliament; and, pursuant to his destructive Counsels, Letters Patents did forthwith pass, and Writs issued, whereby Twelve Peers were made and created; and did likewise advise Her Majesty immediately to call and summon them to Parliament; which being done accordingly, they took their Seats in the House of Lords on or about the Second of January One Thousand Seven Hundred and Eleven, to which Day the House then stood adjourned; whereby the said Rob't Earl of Oxford and Earl Mortimer did most highly abuse the Influence he then had with Her Majesty; and prevailed on Her to exercise in the most unprecedented and dangerous Manner that valuable and undoubted Prerogative, which the Wisdom of the Laws and Constitution of this Kingdom hath entrusted with the Crown, for the rewarding signal Virtue and distinguished Merit: By which desperate Advice, he did not only, as far as in him lay, deprive Her Majesty of the Continuance of those seasonable and wholsome Counsels, in that critical Juncture; but wickedly perverted the true and only End of that great and useful Prerogative, to the Dishonour of the Crown, and the irreparable Mischief to the Constitution of Parliaments: All which Crimes and Misdemeanors were committed and done, by him the said Earl, against our late Sovereign Lady the Queen, Her Crown and Dignity, the Peace and Interest of this Kingdom, and in Breach of the several Trusts reposed in him the said Earl; and he the said Earl of Oxford and Earl Mortimer was Lord High Treasurer of Great Britain, and One of Her Majesty's Privy Council, during the Time that all and every the Crimes before set forth were done and committed: For which Matters and Things, the Knights, Citizens, and Burgesses, of the House of Commons, in Parliament assembled, do, in the Name of themselves and of all the Commons of Great Britain, impeach the said Rob't Earl of Oxford and Earl Mortimer of High Treason, and other high Crimes and Misdemeanors in the said Articles contained. 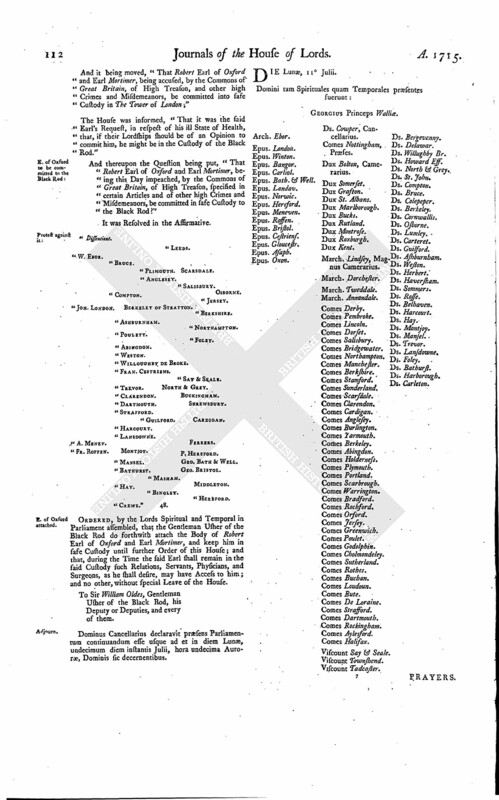 "And the said Commons, by Protestation, saving to themselves the Liberty of exhibiting, at any Time hereafter, any other Accusations or Impeachments against the said Earl, and also of replying to the Answers which the said Rob't Earl of Oxford and Earl Mortimer shall make to the Premises, or any of them, or to any Impeachment or Accusation that shall be by them exhibited according to the Course and Proceedings of Parliament; do pray, that the said Rob't Earl of Oxford and Earl Mortimer be put to answer all and every the Premises; and that such Proceedings, Examinations, Trials, and Judgements, may be upon them, and every of them, had and used, as shall be agreeable to Law and Justice; and they do further pray and demand, that the said Rob't Earl of Oxford and Earl Mortimer may be sequestered from Parliament, and forthwith committed to safe Custody." 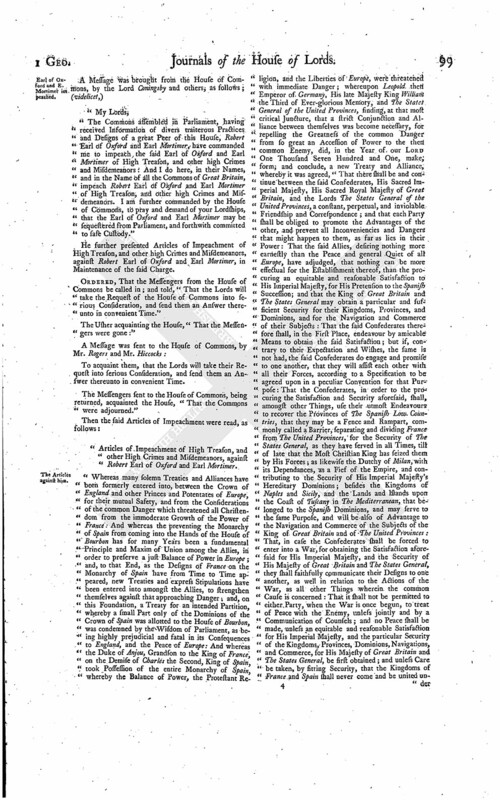 Then a Motion being made, and the Question being put, "That this House will, on Monday next, take into Consideration the Articles of Impeachment, preferred this Day by the Commons of Great Britain in Parliament assembled, against Robert Earl of Oxford and Earl Mortimer, for High Treason, and other high Crimes and Misdemeanors; and also the Request of the Commons, that the said Earl may be sequestered from Parliament, and committed to safe Custody?" "Geo. Bath & Well. Say & Seale. "P. Hereford. Willoughby de Broke. Hereford. "Geo. Bristol. Harcourt. Bathurst. Foley. And a Motion being made, and the Question being put, "That it be proposed to the Judges as a Question of Law, Whether the Two Articles laid as High Treason against Robert Earl of Oxford and Earl Mortimer do contain in them Treason by the Laws of Great Britain?" The Earl of Oxford and Earl Mortimer was heard in his Place, and withdrew. 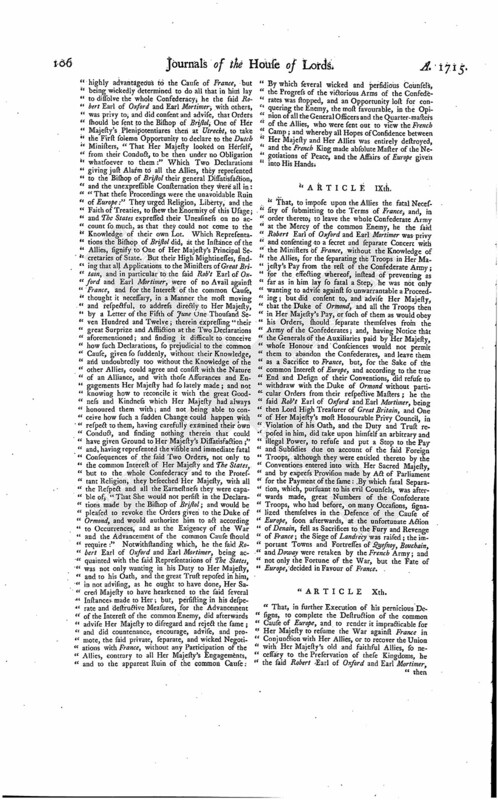 The Eleventh Article of Impeachment was read again. 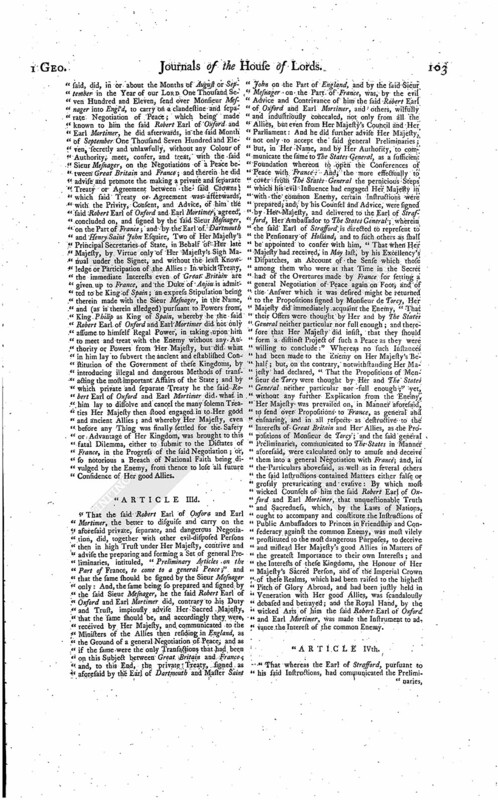 And it being moved, "That Robert Earl of Oxford and Earl Mortimer, being accused, by the Commons of Great Britain, of High Treason, and other high Crimes and Misdemeanors, be committed into safe Custody in The Tower of London;"
The House was informed, "That it was the said Earl's Request, in respect of his ill State of Health, that, if their Lordships should be of an Opinion to commit him, he might be in the Custody of the Black Rod." And thereupon the Question being put, "That Robert Earl of Oxford and Earl Mortimer, being this Day impeached, by the Commons of Great Britain, of High Treason, specified in certain Articles and of other high Crimes and Misdemeanors, be committed in safe Custody to the Black Rod?" "Fr. Roffen. Montjoy. P. Hereford. "Mansel. Geo. Bath & Well. Ordered, by the Lords Spiritual and Temporal in Parliament assembled, that the Gentleman Usher of the Black Rod do forthwith attach the Body of Robert Earl of Oxford and Earl Mortimer, and keep him in safe Custody until further Order of this House; and that, during the Time the said Earl shall remain in the said Custody such Relations, Servants, Physicians, and Surgeons, as he shall desire, may have Access to him; and no other, without special Leave of the House. To Sir William Oldes, Gentleman Usher of the Black Rod, his Deputy or Deputies, and every of them. Dominus Cancellarius declaravit præsens Parliamentum continuandum esse usque ad et in diem Lunæ, undecimum diem instantis Julii, hora undecima Auroræ, Dominis sic decernentibus.